The Commonwealth of Australia Constitution Act sets out the roles and powers of the Commonwealth government with residual matters vested in the states. The states and the Commonwealth each have democratically elected parliaments derived from the British (Westminster) parliamentary system. Although many features of the Commonwealth Constitution (including the federal structure) are based on the constitution of the United States, the main features of the Westminster system have been retained. Queensland is part of a federation of the states and territories which form the Commonwealth of Australia. 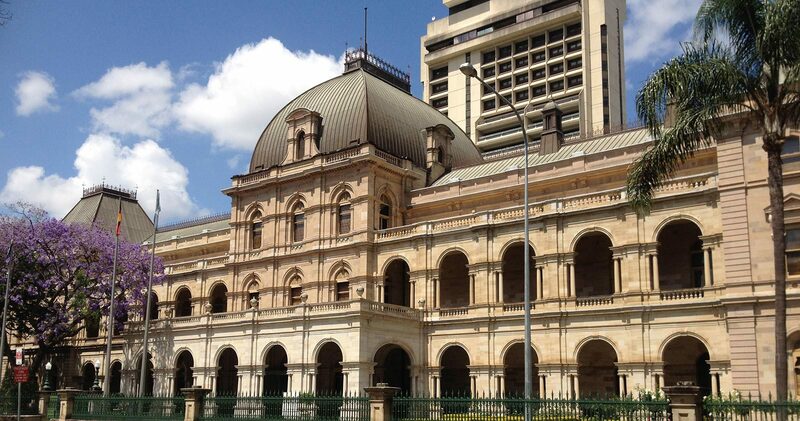 The Queensland state government, like that of Australia, is modelled on the British Westminster system. The state parliament takes responsibility for domestic affairs and shares mutual responsibilities with the Commonwealth government as outlined above. Most of the parliaments in Australia are bicameral (comprising an upper house and lower house), except for the Australian Capital Territory and the Northern Territory, where governments rests with a single house, and Queensland, where the upper house was abolished in 1922. Government in Queensland, like that in other states and the Commonwealth, is based on the system of government evolved in Britain in the 18th century, and which is generally known as ‘Cabinet’ or ‘responsible’ government. Its essence is that the Governor, as titular head of state, should perform governmental acts on the advice of ministers; that ministers of state be chosen from the party or coalition of parties commanding a majority in the Legislative Assembly; that the ministry, the cabinet, so chosen should be collectively responsible for the actions and administration of government departments and authorities which have been created to put into practice the laws made by parliament and that the ministry should resign if it ceases to command a majority in the Assembly. As outlined in the Constitution of Queensland 2001, there are 89 members of the Legislative Assembly.